You might think, like the writer naively assumed, that tracing records for a man with a relatively unusual name like John Foy would be simple. But the name wasn’t at all rare and, without a released Military Pension file for John, it was an interesting brain-teaser. Anyway, it turns out this Custom House man was a true-blue northside Dub, born at the turn of the last century. John’s parents were Galway folk. Speaking of uncommon names, his mam’s original surname appears in old records as Guinnessy (correct), Gainessy, Gunning and even Geraghty. It seems to have depended on how various clerks in Dublin’s registry office interpreted how a lady from the ‘Wesht’ said her surname; and how modern transcribers read their handwriting decades later. At least her forename Bridget was always shown correctly and her husband was in every case recorded as John Foy. Their son John, known as Jackie, arrived into the world at 18 Russell Street on 16 June 1900. That house has been torn down, but the street still turns off the North Circular Road and then becomes Jones’ Road as you approach Croke Park from the city centre. It’s amusing to read John’s mother’s occupation described in the 1901 census as ‘Farmer’s Daughter’. That was a significant status down the country back then, but possibly a bit redundant for the wife of a Bricklayer in the middle of a city with no farm of land? The Foys moved to Mountjoy Parade for a few years where they lived at two addresses, nos. 7 & 10; then to 9 Hawthorn Avenue in East Wall where the father was recorded in the 1911 census as a Brick and Stone Layer, a skilled trade. The family had grown to include five children (surviving from 8 born). John was the only son and was attending school. The following year the Foys re-located yet again to 11 Richmond Parade where their last daughter was born. That makes five different addresses in ten years! And they ended up almost back where they’d started. However, such mobility was not at all unusual in those times in Dublin and shows how social conditions affected ordinary folk. Homes – often rooms – were invariably rented, people had few possessions or even furniture to shift and families often moved as they grew in size. 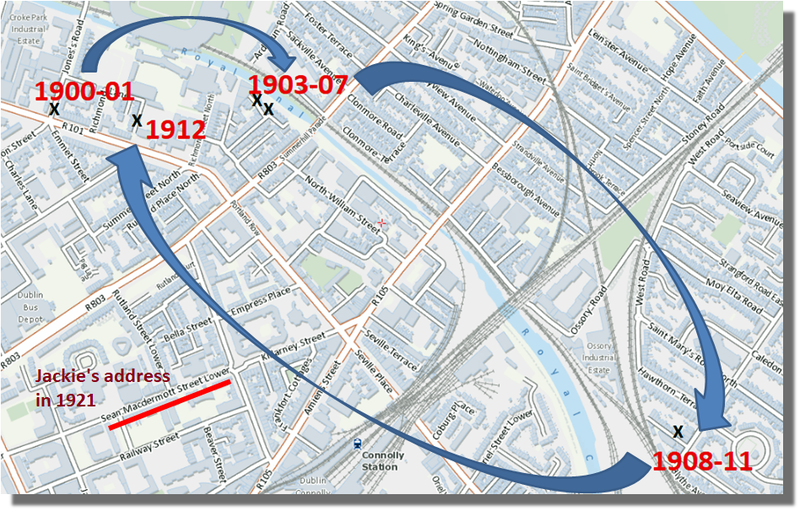 One genealogist has described early 20th century Dubs in the inner city as acting like fleas – they’ve hopped somewhere else every time you trace them…..
As of now little else is known of Jackie’s early life, but he lost his mother Bridget (35) to TB in 1913. It hardly needs to be said but it must have been extremely tough on his father rearing 6 kids and holding down a job without the support of a wife and mother. 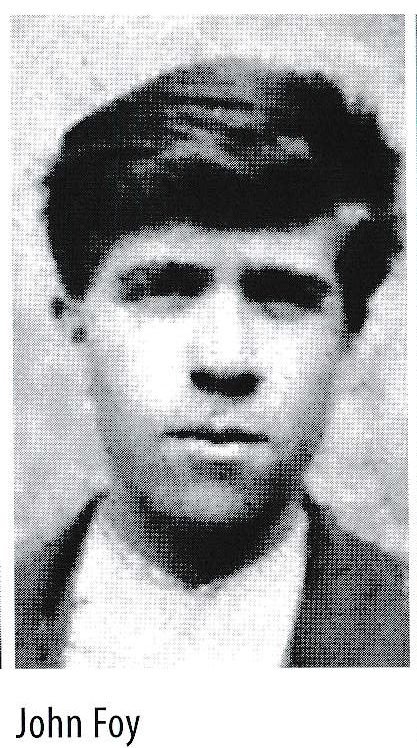 Young Jackie wasn’t out in 1916 – after all, he was then only 15. In 1918 he joined F Coy, 1st Batt. in what was termed the ‘Special Section and Daytime Squad’. He took part in all Coy activities until selected for Dublin Brigade ASU No. 1 Section following the 21 January 1921 Clonturk ambush disaster. In that event 5 men were captured and one killed. Joe Gilhooly (BMH WS0390) says other new members who joined with Foy included Padraig O’Connor, Ned Breslin and John Sliney, while Tom Flood succeeded his captured brother Frank (executed in March 1921) as Lieutenant. All those men were later involved in the Burning; only Paddy O’Connor escaped arrest in the aftermath. Prior to the Custom House attack, Foy had taken part in ASU Section 1 & 2 operations such as ambushes on British forces in Henry Street, Ormond Quay and North Frederick Street, in all of which the IRA used grenades; and the unsuccessful ambush of a troop train at Killester. He claims to have kept an arms dump for the ASU and F Coy in his own house. Jackie was renowned as a Grenade Man. He was expert in handling the dangerous bombs which had very exciting (!) 3-second fuses and using them accurately in action. 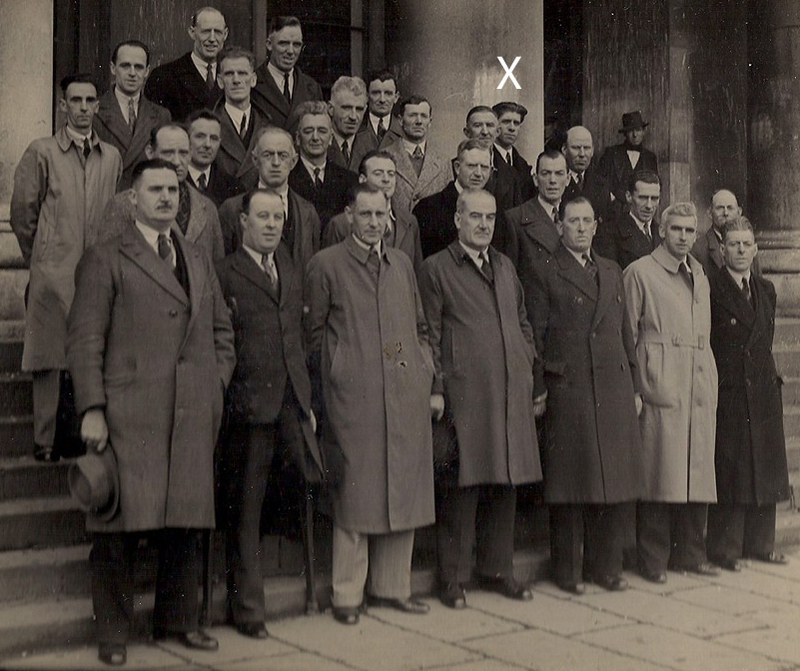 According to Joe Leonard, he was also known as ‘Littler’, an appropriate nickname as this photo should illustrate – he stands beside comrades on both sides towering over him in the back row, 3rd from left. Foy became one of the ASU men arrested at the Custom House on 25 May 1921 for being “implicated in the outrage”. On the arrest sheet his address is 28 Lower Gloucester (now Sean MacDermott) Street and his occupation Apprentice (He’d followed his father’s trade to became a Bricklayer). He was registered as Prisoner No. 2545. 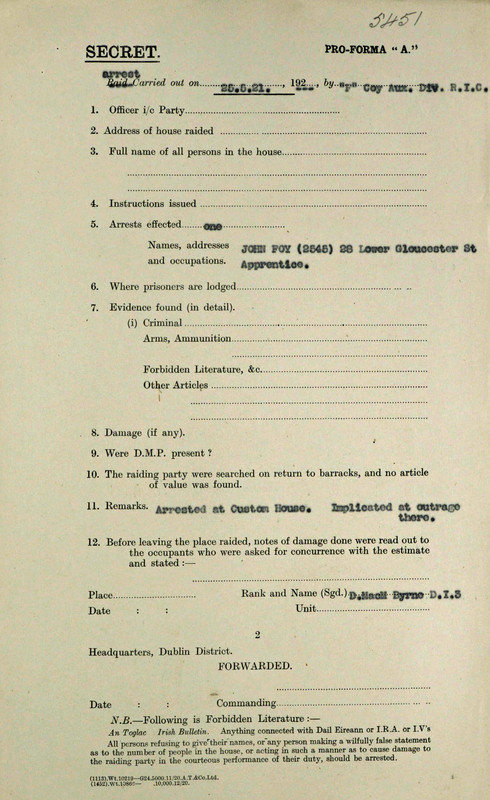 Above is Custom House arrest sheet for Jackie Foy, completed by a Dublin-born Auxy F Company officer (findmypast.ie). Beside that is a photo of Jackie taken afterwards in Kilmainham (The Gaol Archives via Liz Gillis). After his release from Kilmainham in December 1921, Foy may have been at the IRA base in Celbridge Workhouse early in 1922 before officially joining the National Army at Beggar’s Bush on 4 February. He was one of the new Dublin Guard contingent who took over Portobello Barracks from the British. Jackie was posted to Kilkenny as a Sergeant where, according to John Pinkman (in his book ‘Legion of the Vanguard’) he almost shot Foy through the head in bed during some messing with a supposedly empty revolver early one morning. This was before the Civil War had even started! In June he became a 1st Lieutenant and O/C of the guards at, of all places, Kilmainham Gaol where he’d spent 6 months in British custody. Foy was transferred to Gormanston Camp where in September he was made Captain and appears at that rank in the Army Census, with the Guards Brigade, 2nd Eastern Division. From February 1923, Jackie was Camp Adjutant until his forced resignation after the Army Mutiny in March 1924. Like so many other comrades in those times, he had chosen to get married during hostilities, in his case to Florence Kavanagh, daughter of a Printing Compositor from nearby Buckingham Street. Their wedding was celebrated in their parish church on (now) Sean MacDermott Street, 22 November 1922. He is noted as Captain, National Army on the marriage register. 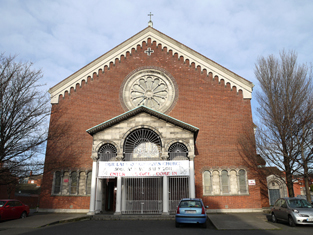 Foy and his wife went on to live at 120 Clonliffe Avenue where they reared 2 sons and 3 daughters and he worked as a Bricklayer. A neighbour in no. 50 until his early death in 1941 was Sean Sliney who’d also been arrested at the Custom House with Foy. Jackie was one of the firing party at Sean’s funeral. 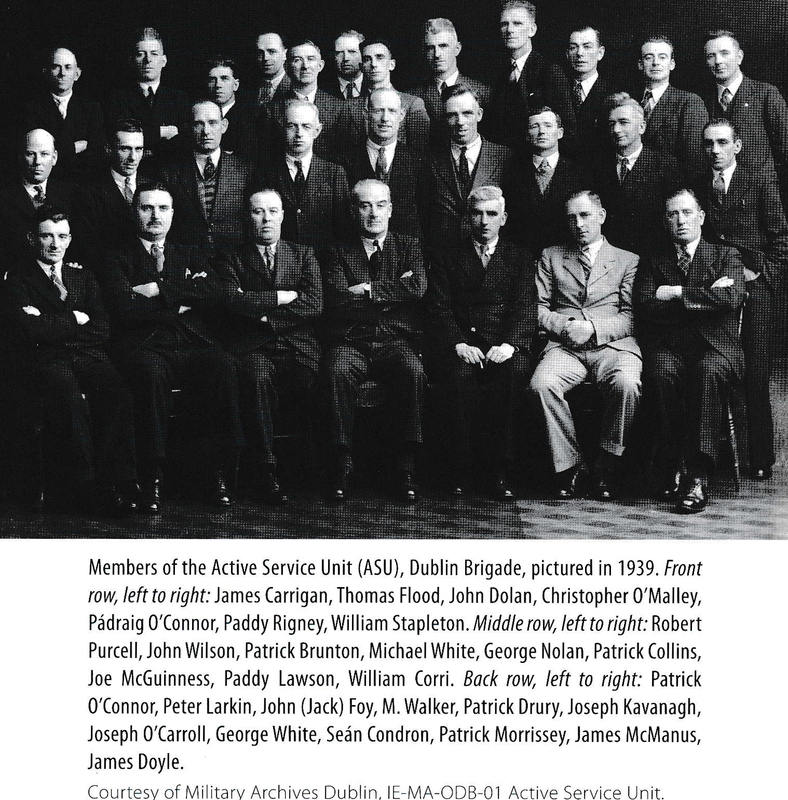 1939 ASU Reunion – Jackie Foy is 2nd from right in 3rd row back (courtesy Gerry Cassidy). In this shot of the same group Jackie is peering around Patrick Drury (Courtesy of Diarmuid O’Connor via Gary Deering). Eleven years later on 4 February 1950, Jackie died at home from TB, the terrible scourge that had taken his mam decades before, four months short of his 50th birthday. 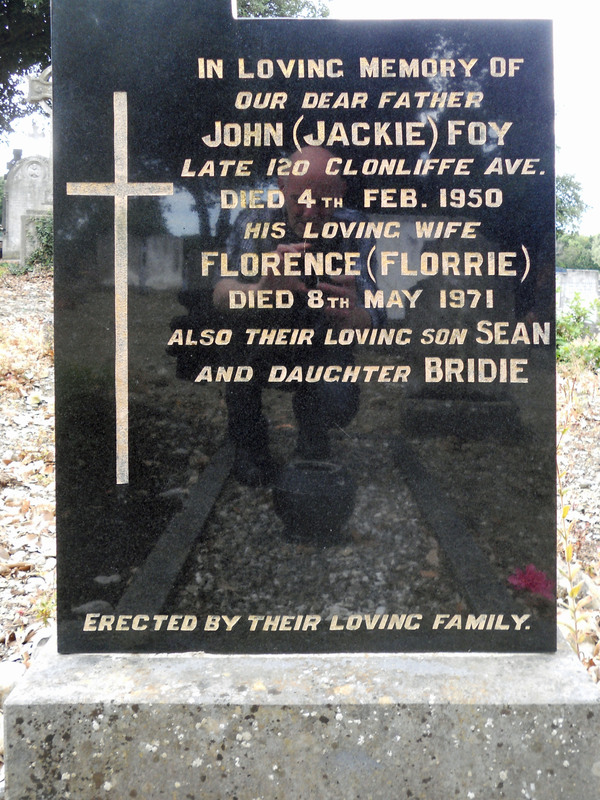 John F. Foy was buried in Glasnevin with full military honours. The chief mourners were his widow Florence, children, father and sisters. 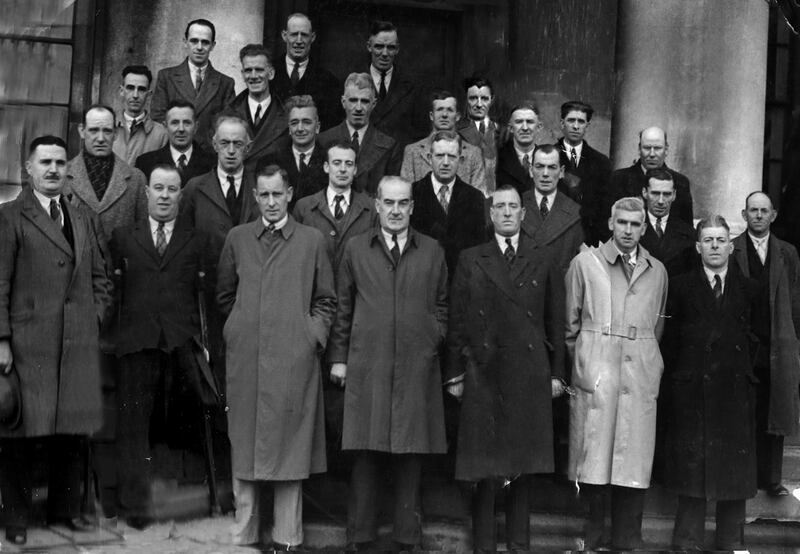 The attendance included many old Brigade comrades such as Paddy O’Daly, Frank Saurin, Charlie Dalton, Vinny Byrne and Piarais Beaslaí, president of the Association of the Old Dublin Brigade. The Foy Family plot in Glasnevin, St Patrick’s Section GJ230.5 (Apologies for the photographer’s ghastly reflection). Dedicated to Jackie Foy’s son Edward. A lovely man who, we were sad to learn, passed away in Dublin on 16 January 2018. RIP. Thank u for a great read on my grandads past.Thank u for dedicating this to my dad .He would have been so proud reading this about his dad .Will always remember him mentioning littler and grenade specialist to me when I was younger but never really put the pieces together until now .Fantastic . My dad is buried right beside his mum and dad .Would loved to have been able to attend .As far as I know my mother ,brother and sister will be there .